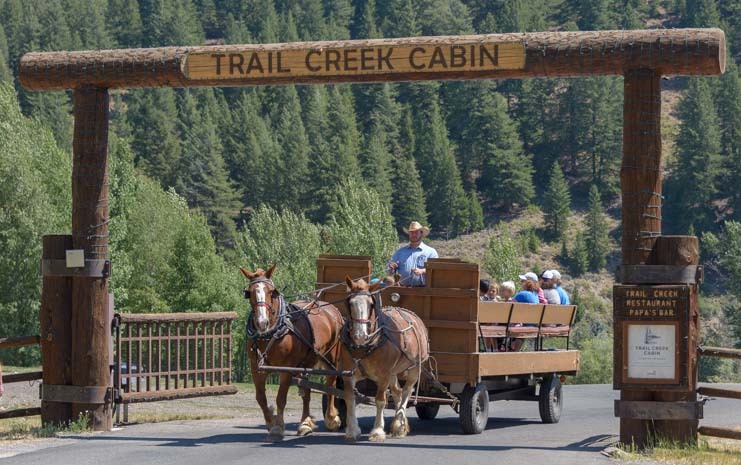 Sun Valley Idaho – An RV Traveler’s Delight in Ketchum, ID! August 2016 – Idaho is a gorgeous state that’s great for RV travel, and the National Forests offer up some stunning scenery. 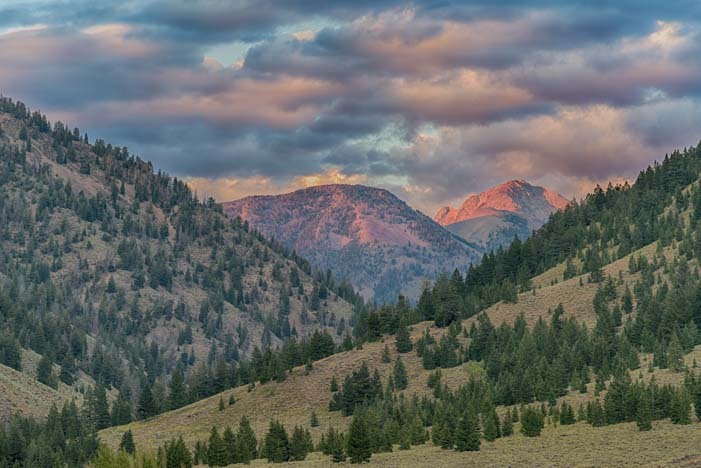 The folks that live in the beautiful communities of Sun Valley and Ketchum are very fortunate to have a playground of alpine glory right out their back door in the Sawtooth Mountains. We have been routing our summer travels to go through Sun Valley as often as possible since we started our full-time travels in our RV nine years ago. Nature gave us summer peaches and blueberries in the sky. In the summertime, the communities of Ketchum and Sun Valley spill out onto the sidewalks. Sun Valley, Idaho, is most famous for its ski resort, which gave the area its name, and it is loved for the fabled winter recreation that goes on in the surrounding mountains. But Sun Valley also thrives under the warm summer sun, and every eatery in town has tables with umbrellas out front. 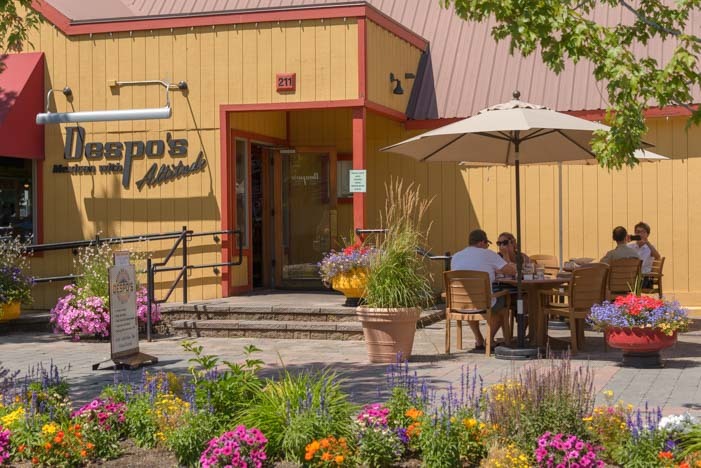 Sun Valley and the town of Ketchum are full of places to catch a bite under an umbrella in the sun! 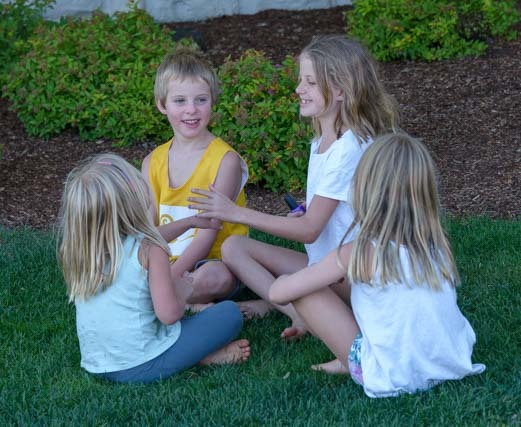 Sun Valley is a relaxed community where life is lived at an easy pace. Yet what sets it apart from most small towns across the country is that it is a hideaway for the ultra rich and ultra famous. From Arnold Schwartzenegger to Bruce Willis and Demi Moore, lots of A-list celebrities have homes here, and they visit their alpine estates for a little down time. 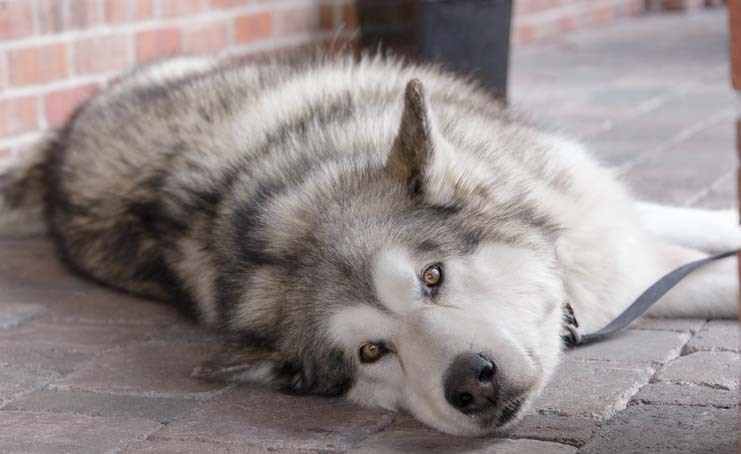 Sun Valley is a place where people (and dogs) come to relax. For the rest of us, there’s no end of recreation opportunities around Sun Valley, even for those on a budget. 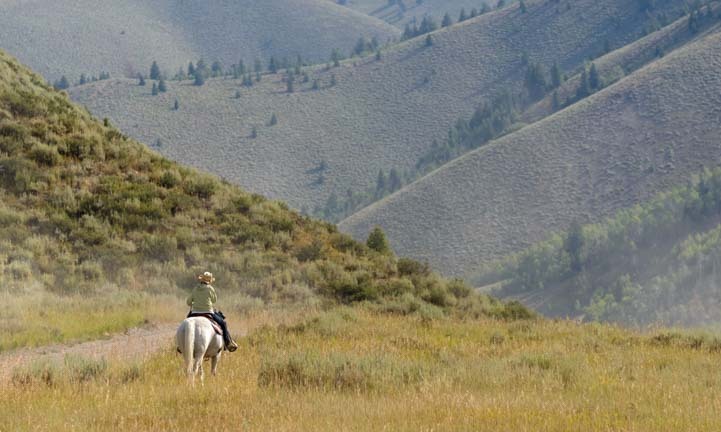 Back when we first discovered Sun Valley for ourselves seven years ago, the Visitors Center published a booklet called 50 Fun Free Things To Do in Sun Valley. They were actually able to list 50 different things! We tried to tick them all off, and we made a good dent in the list, but there are still many things we haven’t yet done in the area! There are loads of fun activities around town and in the mountains — and we haven’t exhausted them yet!! Because of the many celebrities who love this town, there is a lot of money floating around and lots of rich living going on. But somehow there is an inclusive grace to it that lets everyone share in the spoils. My other car is…. a Ferarri. But there are a few second hand stores in town that benefit the fabulous town library, and the cast-offs from the resident billionaires can make for some very interesting shopping!! 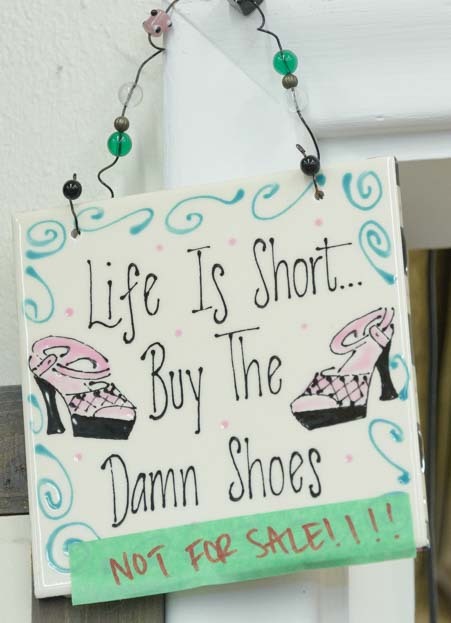 I loved this sign over the register in one of the second hand stores. 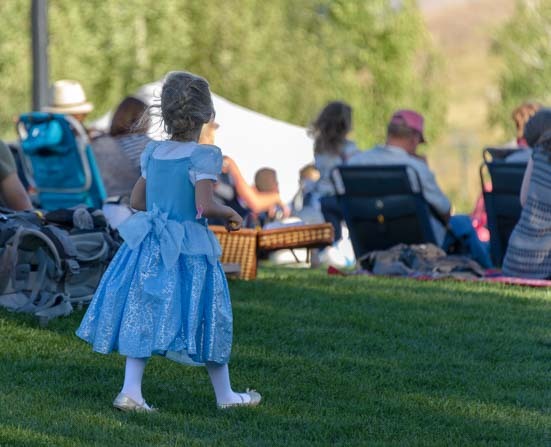 Perhaps the most wonderful thing that the very wealthy have given to Sun Valley and its summer tourists is the Sun Valley Symphony concert series that takes place each August. Besides building an award winning performance Pavilion that is constructed of special travertine stone that was quarried from the same area in Italy as the stone used to build the Roman Colosseum, each summer for the last 32 years the wealthy of Sun Valley have funded a top notch symphony orchestra made up of musicians that are on summer break from the major orchestras across the country. 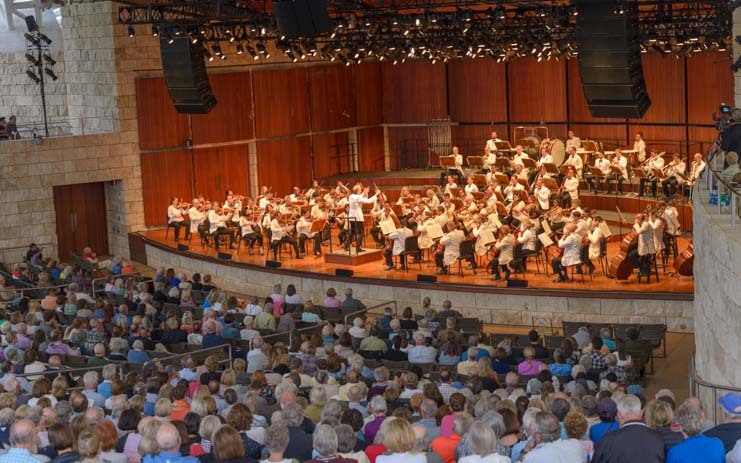 Best of all, the Sun Valley Symphony puts on a free concert almost every night for a few weeks each August. Talk about a gift to the community!! 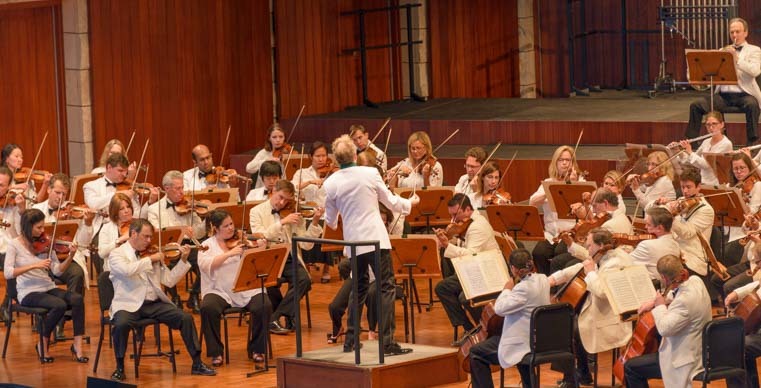 From Pops to Classical, the Sun Valley Symphony keeps the music flowing for free almost every night in August. The cool thing about these concerts is that you can grab any open seat in the Pavilion if you want to watch the performance in a traditional setting. 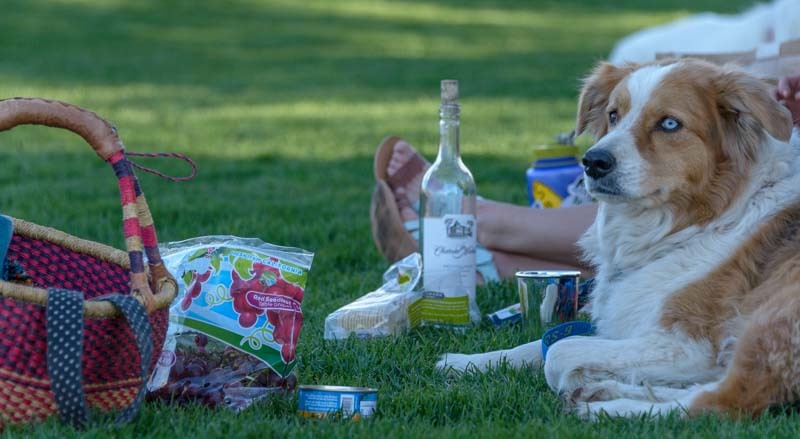 Or you can bring a picnic and sit out on the enormous, lush, grassy lawn where rows of loudspeakers broadcast the music and a massive video screen shows close-ups of the musicians playing. Outdoor summer concerts are a blast anywhere, but in Sun Valley they’ve been refined and perfected, thanks to the local gazillionaires. We’ve enjoyed plenty of performances in the theater seats of the Pavilion over the years, but in reality, sitting out on the lawn is where the real action is!! 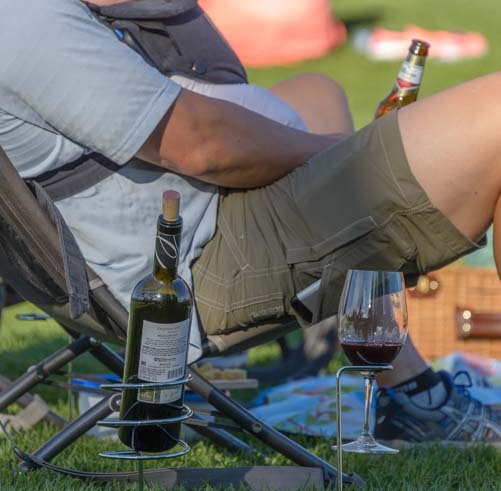 For an hour or more before each concert begins, people show up with picnic blankets and get set up with their beverages of choice while the kids all run around on the grass. Although some of the picnic dinners are humble affairs in Tupperware, an awful lot of people go all out and bring a deluxe spread that makes the neighbors at the next blanket quite envious. 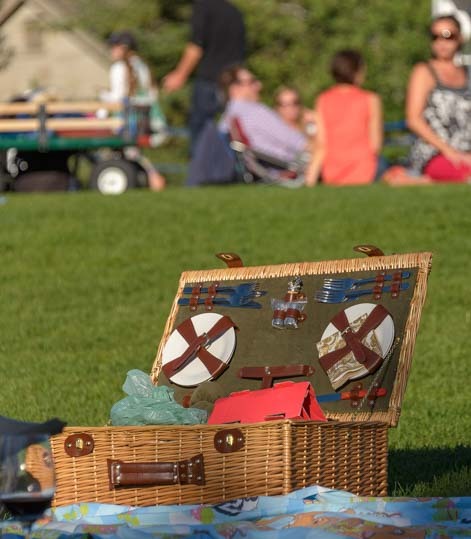 Cheddar cheese and Triscuits in Tupperware are fine for some, but others bring an elaborate spread in an elegant picnic basket. 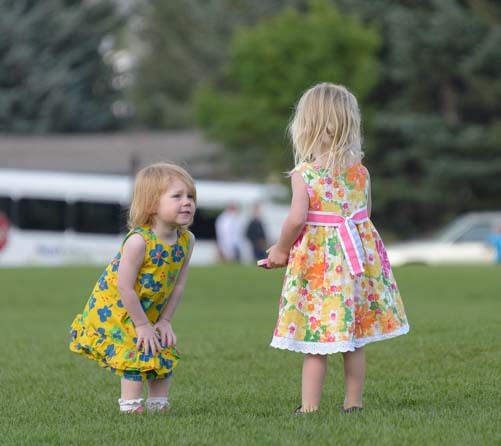 The Sun Valley Symphony concerts are a very social affair, and friends enjoy each other’s company while the music plays in the background. For the locals, these concerts are all about socializing. While the dress code for these concerts is decidedly casual, some people prefer to dress up for the occasion, and there are lots of party dresses to be seen. For a night at The Symphony, some ladies wear their best gown and sparkly shoes! Others just enjoy catching up with friends. 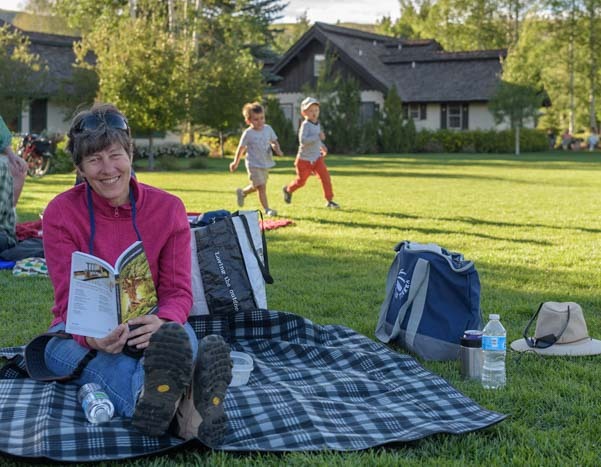 Still others take a load off on their nifty Thousand Trails picnic blanket and read the Symphony’s program notes that are published in a beautiful — and free — glossy book!! I would be doing cartwheels too, but the program notes were pretty interesting! Throughout it all, the the orchestra’s melodies float across the lawn on the late afternoon breezes. The musicians hail from all the major orchestras and they love making music together in Idaho. 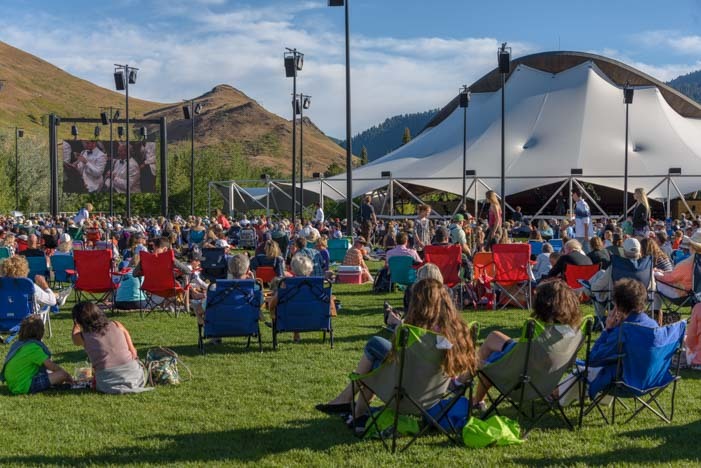 These nearly nightly concerts in August are enough to get our hearts singing, and when we were debating which way to head after we traveled down Idaho’s panhandle and basked on the beach in McCall, there was no doubt in our minds where to go: Sun Valley. 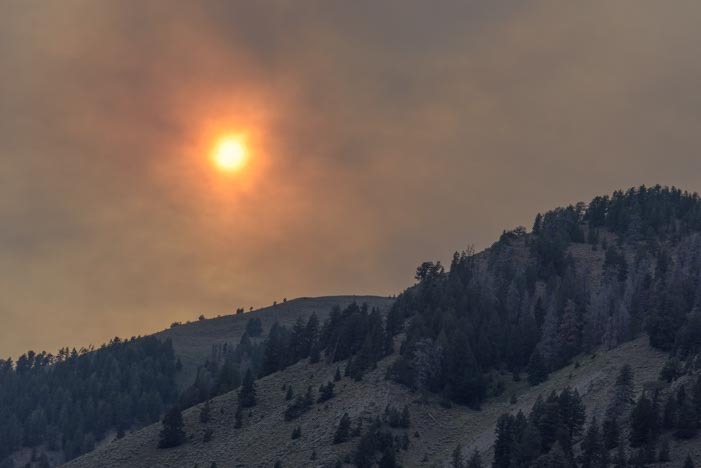 Unfortunately, despite wanting to stay in Sun Valley for a few weeks or more, with dreams of going mountain biking and hiking every afternoon, and sipping coffee on balmy summer mornings at the jaw-dropping Starbucks / visitors center in town, Nature had other plans. Throughout our stay in northwestern Montana and Idaho this year, a wildfire called the Pioneer Fire had been burning near the town of Idaho City about 60 miles from Sun Valley as the eagle flies. It had started on July 18th and had been growing rapidly throughout July and August and proving difficult to tame. 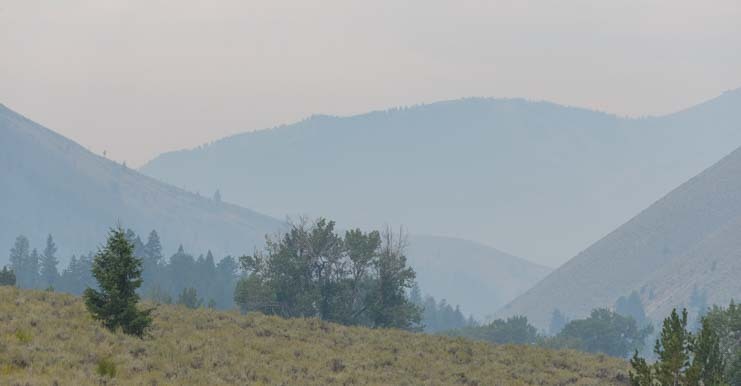 While there was no risk of flames coming anywhere near us, the smoke blew in and out of Sun Valley and the Sawtooth Mountains on a regular basis, burning our eyes and making outdoor activities less than healthy. Sun sets through the smoke. For those who don’t live or travel out west, the concept of wildfires can seem distant and unreal. But they are an integral part of every summer in the dry western states. When we traveled to the eastern states last summer, we were amazed that we heard nothing in the news of any fires out west. Hadn’t there been any? Well, when we caught up with friends once we got back out west, we discovered it had been just as tough a fire season as any. It is alarming to see a map of America’s biggest active wildfires in mid-August. Of course, particulates in the sky are the very fabric of stunning sunrises and sunsets, and we enjoyed a few during our stay. and this photo of Mark’s won “Photo of the Day” on Steve’s Digicam. But when the smoke rolled in and we could taste it on our tongues, we decided it was time to leave. Sigh. Heavy smoke rolled in and out of the valley every day, and we finally decided enough was enough. Wildfires are reported in the news in terms of acres, and dividing by 640 yields the fire size in square miles (i.e., a fire that is 100,000 acres is 156 square miles). The Pioneer Fire which made us flee Sun Valley this year was 42 square miles when we left in mid-August. As I write this blog post four weeks later in mid-September, that same fire is now 290 square miles and is 56% contained, although there are hopes it will be fully contained by September 15th. It is not known yet what caused the fire, and it will keep burning and smoldering right up until it is buried by snow this winter. We did get our Sun Valley fix this year, but we didn’t have a chance to explore any new grounds. However, we will definitely be back, as it is a town that totally enchants us every time we visit. 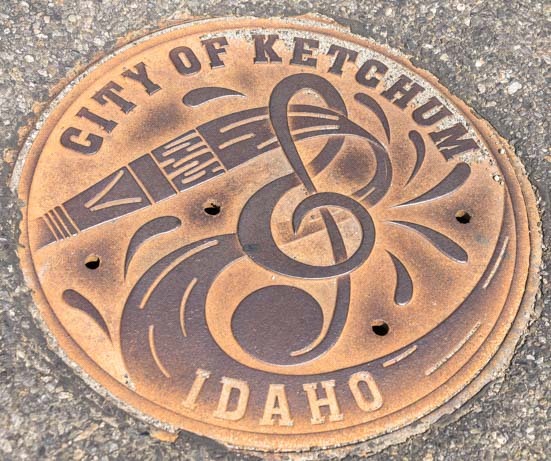 I mean, who can’t love a town so classy that the man hole covers in the streets are stamped with artwork featuring a musical G-clef?!! Sun Valley is a class act from head to toe. Even their man hole covers are decorated with beautiful art work!! 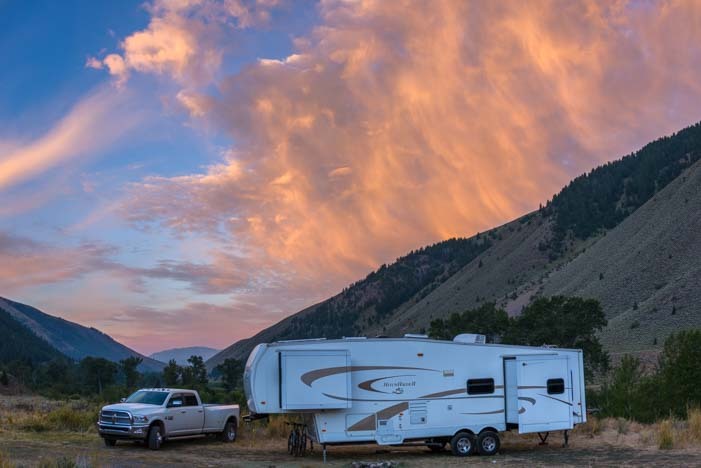 We have enjoyed Sun Valley in the past so much that we have written articles about it for Trailer Life Magazine, Highways Magazine and the now defunct RV Journal! 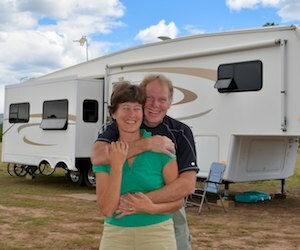 We hope you love it too, and to help with making plans for an RV trip there, we’ve got a few links below. 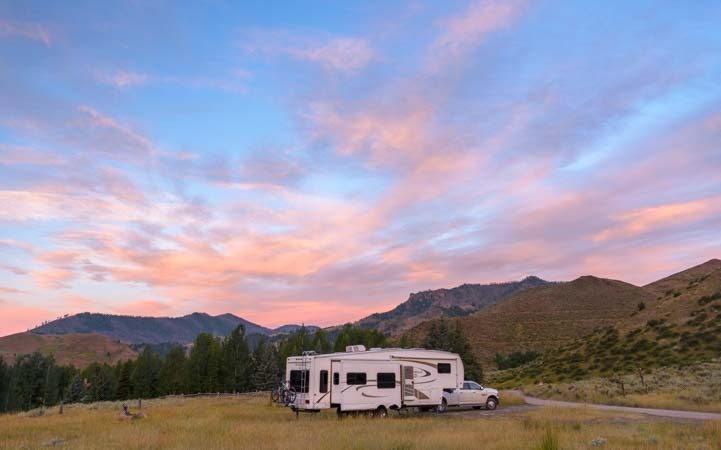 All of our RV travels in Idaho can be read by clicking HERE! 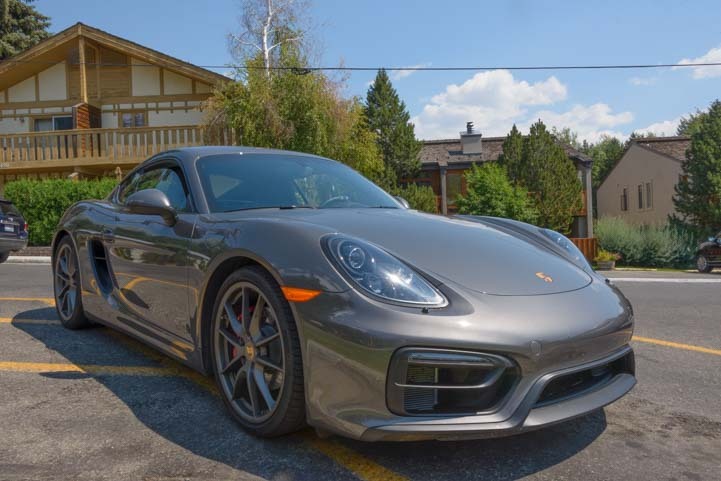 This entry was posted in Idaho and tagged Idaho, New, Sun Valley Area, Travel, USA, WP Travel by Roads Less Traveled. Bookmark the permalink. Hi guys, another great post and timely, too. We’re in Troutdale, Oregon visiting my Son and thought we might head out East to the same areas you have been writing about in the last couple of posts. Didn’t even realize there was a massive fire going in that region of Idaho. Do you think the air quality would be okay if we didn’t travel any further East than MaCall? We haven’t seen any of Idaho since we started our travels a few years ago. If you don’t mind me asking, what direction are you heading now? Definitely explore as much of Idaho as you have time for, Lew! We had the same debate as you a month ago, and we decided to give Sun Valley a try anyway. It was awesome for the better part of a week, and we’re really glad we went. If there’s smoke — or anything else that bothers you anywhere — you’ve got wheels. Isn’t it an awesome life??!!!! We just crossed over the southwestern border of Colorado this morning with hopes of seeing the fall color in the mountains in the next few weeks. Thanks for the words of encouragement. We are heading East as soon as we wrap up our Portland adventure. Looking forward to your Colorado posts. Thanks, Lew. There are lots of Utah national parks posts coming up in between (we had an incredible travel season!). Have a wonderful adventure. I’m sure you’ll fall in love with Idaho just like we did! !